Quality varies vastly when it comes to outdoor patio furniture brands. As with everything in life, manufacturers have different standards of quality control, attention to detail, and customer service. These are among some of the factors that were used to compile this list of the Top Rated Outdoor Furniture Manufacturers. The ability to be comfortable and remain stylishly in fashion has evolved. In the past, manufacturers seemed to struggle with creating concepts that could take a beating from Mother Nature while retaining a sound architectural design. This is no longer the case as these outdoor furniture companies have gone above and beyond all expectations. 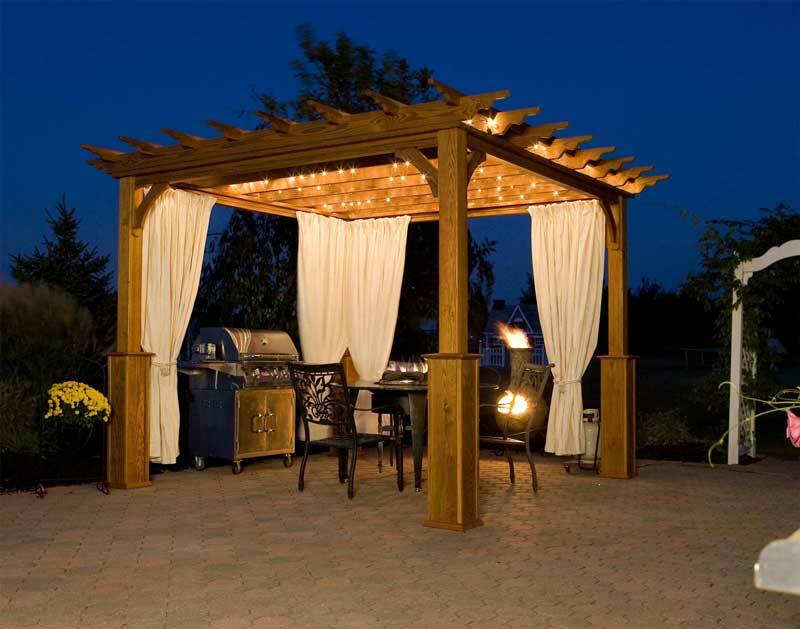 To view a complete list of Patio Furniture brands, you can check out this page with over 30 of the top names including Caluco, Sunset West, Harmonia Living, Compamia, Whitecraft, and more! The Brown Jordan Papillon Collection. Founded in 1945, Brown Jordan has consistently ranked among the top rated outdoor furniture brands. 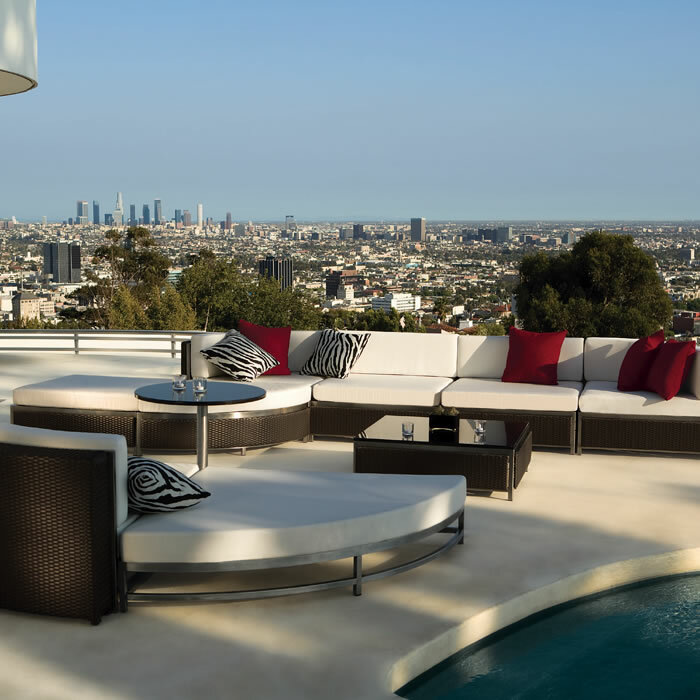 Based in Pasadena, California, Robert Brown and Hubert Jordan first started the company to make exclusive luxury-quality all-weather outdoor furniture. Brown Jordan is noted as being the innovator who introduced tubular aluminum and vinyl lace designs, called “Leisure.” With over unique 30 collections, Brown Jordan is the “best of the best” when it comes to patio furniture. While their collections are pricey, Brown Jordan is a recognizable brand that is guaranteed to meet all expectations. 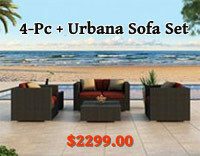 3 Piece Barbados Sofa Set from Forever Patio. Forever Patio has an expansive collection of high-end patio furnishings, including everything from daybeds to bar tables. What’s great about this Brand is their tasteful designs. The construction of furniture is methodical and details of styling could be examined under a microscope. As the name implies, Forever Patio has a proven track record of introducing highly durable outdoor furnishings with the latest in all-weather construction being incorporated in every aspect of the design. Forever patio is a mid-range patio furniture brand that satisfies all concerns while keeping costs at a minimum. 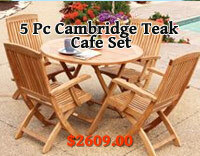 You can browse more Forever Patio furniture here. 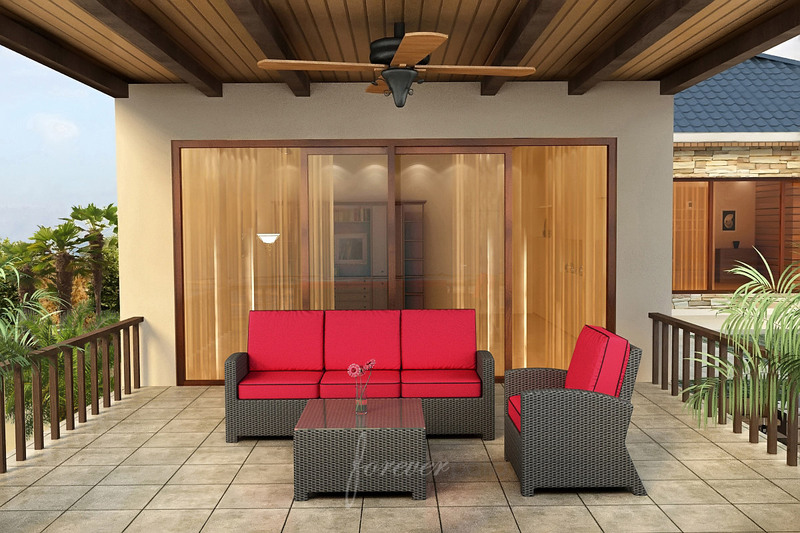 View featured collections from Forever Patio. The 3 Piece Stacking Pineapple Set from Harmonia Living -Just $799 (price subj. to change – see product page for current pricing). Harmonia Living is a trusted brand of wicker furniture. Hand-woven wicker has the tendency to unravel over time but this will never happen with the luxe Urbana Outdoor Sectional Collection. This is because Harmonia Living specializes exclusively in High Density Polyethylene Wicker, an eco-friendly material that is scratch resistant and infused with UV inhibitors to prevent sun fading. 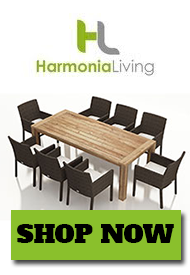 What’s more, Harmonia Living offers quality outdoor furniture at a reasonable price point. In comparison, a sectional set that might cost $3,000 from Harmonia Living may run upwards of $10,000 from a brands like Gloster and Brown Jordan. Make no mistake, if you are willing to pay the price, those brands will be satisfactory but if you’d like be able to put your kids through college, Harmonia Living is your best bet. View featured collections from Harmonia Living. Curved teak slats in the Gloster Bella Collection. Gloster is another big name brand that is mentioned in the likes of Brown Jordan and Harmonia Living. With a strong global presence, Gloster is especially renowned for its quality teak furniture. Using refined techniques, they manufacture all-weather furnishings that are completely weather-resistant. 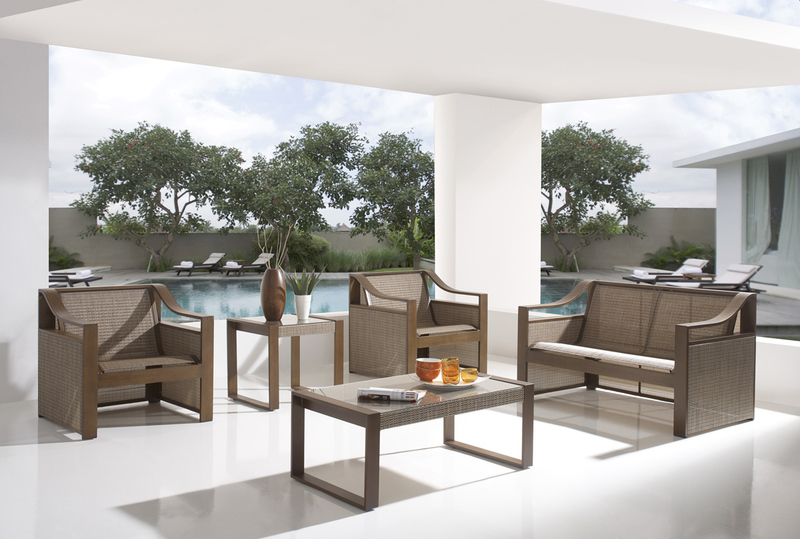 Gloster offers an expanse of teak collections that are sourced directly from teak plantations in Indonesia. A British company, Gloster manufacturers some of the best teak, woven, aluminum, and stainless steel outdoor lounge furniture. The 7 Pc. 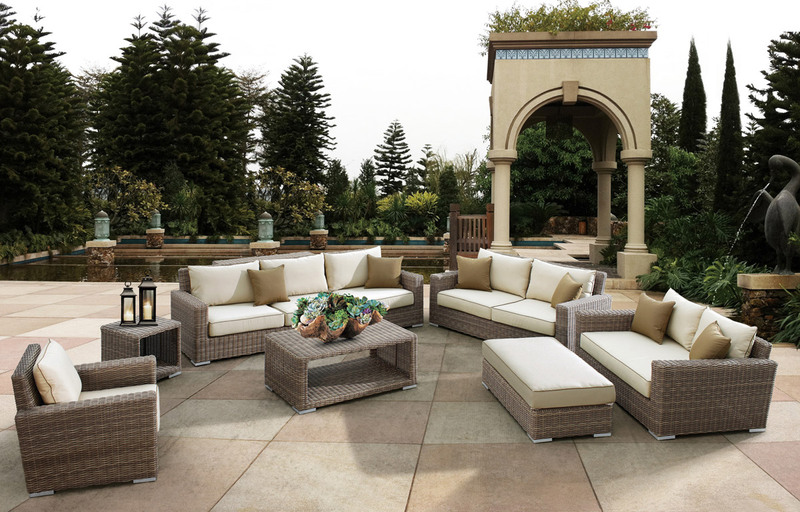 Coronado Wicker Sofa Set from Sunset West – On sale for $7,186 (price subj. to change – see product page for current pricing). Sunset West is a company that is deeply rooted in the furniture industry. The brand has been passed down through 3 generations and continues to be a family-owned business. Their customer service superb and their knack for design is equally impressive. Sunset West offers deep-seated designs that are aptly named after iconic locations in the Southwestern city of San Diego. You can visit them at sunsetwestusa.com. View featured collections from Sunset West. 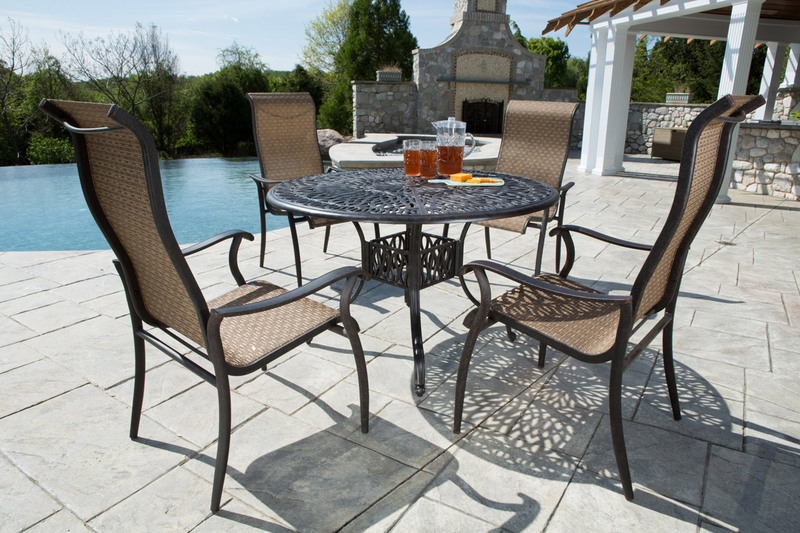 The 5 Piece Charter High Back Dining Set from Alfresco Home – Just $1,375.00 (price subj. to change – see product page for up to date pricing). Alfresco Home is another big name brand that often comes up in discussion. Alfresco products are decorative, inspiring, and cutting-edge. Alfresco Home makes some of the best outdoor furniture at moderate price points. Their casual collections include cast aluminum, woven wicker resin, and marble mosaic garden furniture. View featured collections from Alfresco Home. The oldest on the list, Woodard has been around for over 140 years. Not bad for a company that still employs the same age-old hand forming techniques that have been used for generations. Woodard has adapted to the changes of modern technology, housing state-of-the art equipment to manufacture exotic, contemporary, and classic styles. They maintain an unblemished level of quality due to a process that has been perfected over the years. The purest aluminum extrusions and the most durable ingots are molded and forged into shapes before receiving a scuff resistant powder coat finish that prevents rust. Woodard has a characteristic gloss that is baked onto metal using a modern electro-static technique that increases durability. See more of Woodard here. View the Jax Set Chat Set from Woodard. Since 1954, Tropitone has built a grounded reputation of being the type of company that likes to “get it done the first time.” Originally established to serve the commercial market for motels, clubs, and exotic resorts, Tropitone is found on many a lawn across the United States. 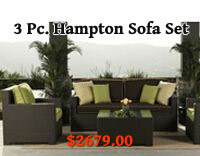 They are a leader in the patio furniture industry with a commitment to quality and comfort. With innovative designs, Tropitone captures the essence of outdoor living. The 6 Pc. Runo Sectional Set from Zuo Modern – Currently not for sale. Zuo Modern has some absolutely remarkable designs that are forward thinking and awe-inspiring. With multiple international locations, their breadth spans across the globe and stands as a testament to their widespread appeal that is able to traverse vast boundaries. If you’re looking for something eye-catching, Zuo Modern would be a worthy brand to take a look at. While their price point is not the most inexpensive, it is still very affordable given the unparalleled creativity place into their imaginative designs. Zuo Modern is well-worth the extra dollar for the authentic designs they invent. View featured collections from Zuo Modern. 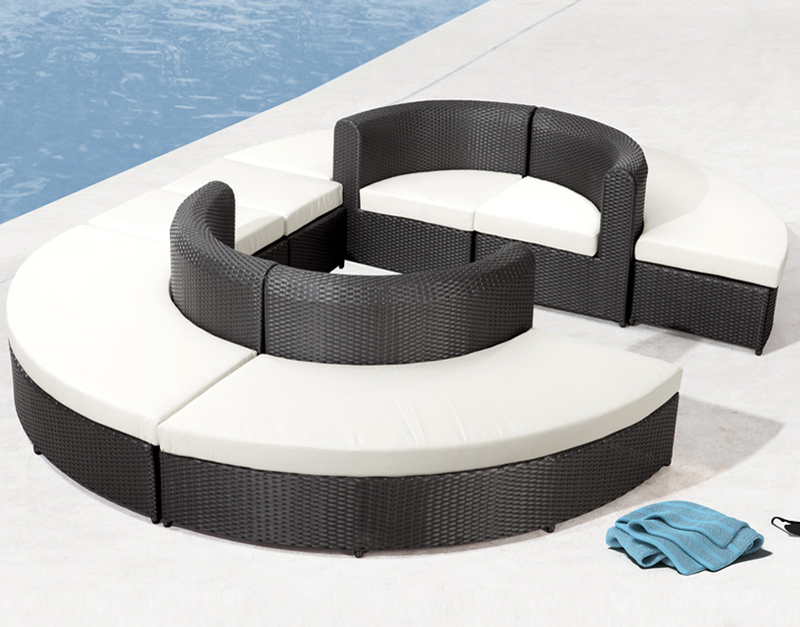 The 5 Piece Venetian Outdoor Sofa Set from Hospitality Rattan – Currently not for sale. Hospitality Rattan has grown to gain recognition from companies that have been around for years. They manufacture both indoor and outdoor collections and their outstanding designs make it evident that Hospitality Rattan is well-versed in the common pitfalls of outdoor furniture. All-weather constructions land Hospitality Rattan on this list of top rated outdoor furniture brands. 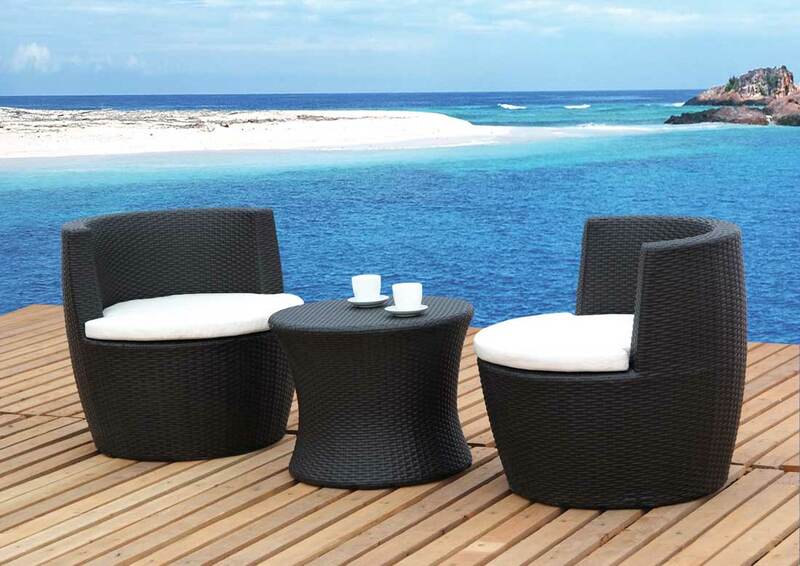 View featured collections from Hospitality Rattan. In most cases, you can tell whether the set you are considering will withstand the test of time by looking for a few key elements. I’d recommend these buyers guides to anyone shopping for outdoor furniture this Spring. This will help you become familiar with some of the key terms and features to look for. You might think that you can find the same quality of furniture at your Big Box stores but that’s not the case. The quality of these brands simply can’t found in generic outlets and instead must be sourced from smaller specialty stores that know their product inside and out. Put simply, you don’t find high-end clothing & apparel at JC Penny. You’d have to go to Dolce & Gabanna or Neiman Marcus for that. This post was authored by Cheryl Khan. Cheryl is able to lend insight on this topic after spending years in the design field. She has learned that all outdoor furniture is not the same and always advises clients to seek the very best patio furniture from brands on this list. She’d never make a recommendation that she wouldn’t use in her own home! How is the quality of outdoor Wicker furniture purchased from Crate and Barrel? While we don’t have the ability to comment on a specific retailers quality of product due to legal liabilities, I can tell you that Crate & Barrel does carry one of the brands listed here and that is Alfresco Home. We actually specialize in outdoor wicker furniture and have curated a list of the Top 5 outdoor wicker brands. They are Harmonia Living, Forever Patio, Sunset West, Hospitality Rattan, and Zuo Modern. The key to wicker is the type of material used (PVC vs HDPE) and the number of wicker strands used on a single piece of furniture. PVC wicker is essentially plastic. It will crack, scratch and fade noticeably whereas High Density Polyethylene is infused with UV inhibitors which prevent fading and are also scratch resistant. All wicker sets are hand-woven so this plays a role in the durability of the product. Some cheaper sets save money by purchasing scrap wicker strands that are shorter. This means that your furniture will have more beginnings and ends and increase the likelihood of the wicker unraveling. You also have to consider how the ends of the wicker strands are tied. Quality sets are wrapped around an end point multiple times and then stapled to the frame to ensure that your wicker doesn’t unravel. All of the manufacturers I’ve listed above do an excellent job at this. If you’re looking for the absolute best wicker, Sunset West, Harmonia Living, and Forever Patio are your best bet. The benefit from ordering from a specialty store like us is that you have full ability to customize your order. You can customize your seat cushions with many different top-grade Sunbrella Fabrics which are really the industry standard; all filled with Dacron cushions. Choose from custom welting and over 200 custom Sunbrella fabrics. You’ll also find a much wider selection with many different outdoor materials including wicker, teak, wrought iron, aluminum, and polywood. This means that you won’t have to settle on a collection that is “sorta” what you’re looking for. I am looking for an old Winston swivel chair made of aluminum . Know where I might find one ? What about the Brown Jordan made exclusively for Home Depot? Is that up to par with the rest of Brown Jordan manufacturing? So we actually went to a couple nearby Home Depots and checked it out. All the furniture seems fine – quite good, in fact. Again, I’m not familiar with the Home Depot brand “Brown Jordan” furniture, so I can’t speak specifically and objectively to its quality. But for the price point, it seems like a good deal. But that’s what you’re getting – a deal. I would not say that the Home Depot furniture is quite on the level with most Brown Jordan furniture, but its price point reflects that. You get what you pay for, etc. Interestingly, the rep I talked to at one location couldn’t really answer a lot of my questions when it came to comparing their collections to other Brown Jordan sets. Probably because they didn’t sell other Brown Jordan sets. Everyone was very friendly and helpful as they could be, though. So, to summarize, if you’re looking for a great deal on some really good furniture (and don’t mind assembling it all yourself), buying the exclusive BJI furniture from Home Depot is probably the way to go. But if you’re looking for a really good price on some great furniture, and want the full customer service experience and the best policies – I think Eli’s story illustrates that decision better than I could here. Either way, I hope you find something that works perfectly for your home. Sorry we couldn’t help you more. And thanks so much for the interesting question! It was fun to get out there and experience some other companies’ furniture, and very educational for us. Thank You for directing me to the brand man speaks article, it was interesting and enlightening, I noticed that the original question and your answer were both posted in 2015, so I wondered why you cited an article that was written 8 years ago? Are there no more recent articles that talk about exclusives? That’s a good question. It pretty much comes down to the adoption of customer reviews for product pages. That is where most people turn to when they want a second opinion. It’s very convenient too because you can find reviews on the same page of the product you’re shopping for. If you go on the Home Depot website, each Brown Jordan has plenty of reviews to inform customers when making a decision. The fire pit in the last photo is stunning! Where is it from? You know, we looked everywhere for it and couldn’t find it listed. We originally found that image on Decor Pad as cited on the image, and they don’t mention it specifically by name/manufacturer. We dug a little deeper and found the original deck designer, but she doesn’t list the firepit specifically in her portfolio. With some Googling, we found the image show up in a few more places on the internet, but alas, no one claims it or names it. We’re sorry Dana, this one remains a mystery. You may have already seen this, but we actually sell the “Baltic Propane Fire Pit” made with a durable and lightweight fiber-concrete mixture. It’s one of our best sellers! It is not the same firepit as in the photo, as the one in the photo looks to be around 5 feet long while ours is a little over 4 feet, and it appears to be a dark black finish, while our baltic is an “almost black” hue. Of course, with the lighting of that photo, it’s really hard to say. Sorry we couldn’t be more helpful! We hope you find a great firepit for your patio, regardless of whom you buy from. Have a great day! EDIT: We said the one in the photo looks to be 5 feet, but that is clearly wrong, as the pictured firepit is actually quite longer – it seems at least as long as the 3-seat sofa it sits in front of, and 3 seaters are typically between 6 and 8 feet long. Sorry for the inaccurate guesstimation! Do you have any insight into the quality of outdoor furniture from Pottery Barn? I was looking specifically at the Madera Teak Daybed they are currently selling, but am very hesitant given some bad reviews online of other PB outdoor furniture. But, so far, I’ve not been able to find a similar double lounger with attached canopy from another company. And at $3999 on sale (normally $4999) I definitely don’t want to buy it and have it look awful a few summers from now!! Thank you. Just wanted to say thanks for this article. I’m also very impressed with your willingness to take time to respond to the comments with clear, in-depth answers. I’ll certainly follow the guidance at this site for my outdoor furniture shopping needs! I wish there were more folks such as yourself on the web. Have a nice day! Are there any really comfortable deep seated & high back outdoor furniture available? Most seem like they would not be comfortable enough to sit and read in. That’s a great question because we just added new items to the Winslow Collection by Forever Patio, which include a High Back Swivel Glider and a High Back Rocker. Both feature comfortable deep seating and plush oversized cushions. If the style is to your liking, I would definitely recommend them. Hello, Great article and feedback…….. I’ve got a new product that I’m introducing to the American Market for Spring 2017. It’s a deep seated – Teak hammock. It’s fully adjustable so you can adjust how deep you want the cradle to be, and we also offer the same style of hanging chair. We use sustainable Grade A plantation teak from Indonesia. Please check us out, and contact me if you would like any further information. Dreamweaver Hardwood Hammocks – Hopefully we can make it on your top 10 list in the near future! How is the quality of the sets sold at Costco? They are Veranda and Agio, but we wonder if they are really the same as the same brands sold at patio stores. Thanks! The brands sold at patio stores tend to be a higher level of quality than what you would find at Costco. Especially the brands mentioned in this blog post. If quality is your top concern, here are some key features to look for when shopping for patio furniture. High Density Polyethylene (HDPE) wicker with infused color and UV protection – This type of synthetic wicker is designed to be weather resistant and avoid cracking and peeling in the sun. It also resistant to cold weather. With color that runs all the way through, scratches are almost impossible to see. Do you have any information on the quality of Restoration Hardware’s patio aluminum sectionals, sofas, chairs? Thanks so much! We took a look at their products and found them to be comparable to other brands such as Sunset West and Summer Classics, which are some of the best brands on our site for aluminum outdoor furniture. The real difference comes down to your personal style choice. Rattan furniture, cheap material not made for the sun. It rips, fade and tears, sun damage. Do you know anything about the quality of Frontgate outdoor furniture ? In terms of quality, they use the same high quality materials you would want to see from high quality outdoor furniture. High Density Polyethylene (HDPE) wicker is very important because it’s currently the best synthetic material for the outdoors. Powder coated aluminum frames are practically rust-proof and is light enough for patio furniture. And they also offer Sunbrella fabric cushions, which is the best choice for outdoor fabrics. You should be know that Harmonia Living offers the same level of quality for a much better price. Comparing prices for a single sofa with Sunbrella cushions, the difference was around $2,000. The only major difference is the look and design of the pieces, but they use the same materials. Full disclosure: We compared the Arden Sofa with Sunbrella cushions against the Anderson Sofa with Sunbrella cushions. I just bought a set of Castelle (Pride Family Brands) French Quarter pieces. I paid quite a lot, at a local outdoor furniture store in DFW area. Do you have any experience with this brand and the quality/durability? It was incredibly comfortable, and one of the pieces was even a recliner, however I may be having buyer’s remorse due to the high price tag and since I have never bought patio furniture before, I don’t know what I was getting in to. Everything else I saw, like at big box stores, Nebraska furniture mart, etc just felt cheap to me. We don’t carry them on our website so we can’t speak from first-hand experience. But they offer a 15 year warranty on their frames and 5 year warranty on the finish, which means they must use high-quality materials. They specialize in aluminum, which is one of the best materials for outdoor furniture due to the rust resistant properties and light weight of the metal. Sounds like you have a good sense for quality. Congratulations on your recent purchase, hope you enjoy it. What is your educated opinion of the teak outdoor furniture offered by crate and barrel. They advertise the teak is grade A from a teak plantation in Indonesia. And based on what I’ve read in other sources, teak wood from that part of the world is among some of the nicest. The furniture I’ve looked at in their stores appears to be very nicely made and the qualities of the teak matches what grade A teak should look like. Thoughts? When it comes to teak furniture, it’s important to look for teak that comes from a sustainable source and certified by the Forest Stewardship Council (FSC). Grade A teak has a uniform rich blond color and tight grain that makes it stand out from B and C grades. Without seeing it in person it’s impossible to make an educated opinion, but the furniture appears to be a high quality, equal to the teak furniture on our own website. Rust-free frames are painted to color match weave. You can tell a lot about a manufacturer by the type of warranty offered with their products. Great Gatherings offers a 15 year residential warranty on the frames of their outdoor furniture. Less for the finish and fabrics but that is to be expected. The frame, or structure, is what is most important because cushions can be replaced and finishes can be painted over when worn. I would also like to recommend taking a look at the new Bridgetown Collection, it is also cast aluminum with a classic ornate style but for a much lower price. Great, I will check it out. Can you recommend best rated fire pit dining tables please. Thanks again. Hello, I found this post while trying to find reviews for Palmer Henley outdoor furniture, specifically the Bryant. After googling it seems like they are predominantly sold at home and garden shows at a large discount over “retail”. Are you familiar with this manufacturer/their quality? After reading this post my wife and I will definitely be looking at the brands mentioned above but any info you can give on Palmer Henley would be appreciated! You can tell a lot about a manufacturer by the warranties of their products. It speaks to the level of confidence they have in their own products. And as a customer, if you are paying a certain price, you expect a certain level of quality and assurance. After browsing their website, we noticed that Palmer Henley only warranties the frames of their furniture. They have no warranty for the finish of the wicker or the fabric of the cushions. They specifically state, “The fabric will not be under any guarantee. We also do not warranty against any type of fading from the sun.” This tells me that they expect the wicker to fade, as well as the fabric. A 5 year warranty for an aluminum frame is standard in our industry, but it’s the warranty of the wicker and fabric that separates high quality products from those of a lower quality. I am looking at some wicker sets at consignment shops. There are no markings on the sets to tell me the maker. Should I avoid them? That’s a great question. You should definitely be careful but there is also a chance of getting a great deal. Does the furniture look like it has never been used? Some outdoor furniture dealers go through outside sources such as consignment shops and craigslist to sell off old stock/discontinued products. But they have to remove any markings in order to avoid certain conflicts of interest. If you’re familiar with outdoor furniture brands, you may be able to track down the maker by comparing images online. It’s possible you can get a high quality set at the fraction of the retail cost this way. I find your customer-education incredibly helpful! The grades of wicker, the benchmark of warranty to judge quality, and your other insights are educational. Your educating the customer base has earned you my trust and future business (my wife wants to someday re-do our entire courtyard). That being said, the brand I have had for a decade has a solid 15-year warranty, (although my powder coating is in horrible shape) but I have heard no mention of it anywhere online except their own website. Thoughts, impressions, or opinions about Telescope Casual Furniture (I have six of the Lisbon sling swivel chairs). Sorry for keeping you waiting, we like to reply to questions and comments within 2-3 days at most. We are currently expanding our business and our whole team is a little busy. Thank you very much for the kind words, it’s our mission to educate customers as much as we can. Like you said, we believe that is the key to keeping them coming back. 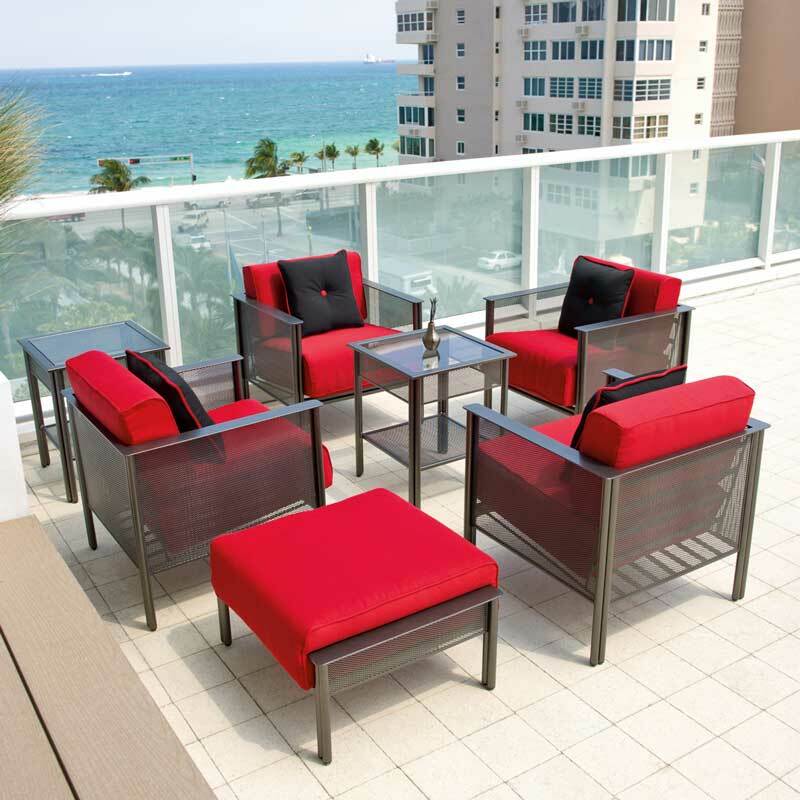 Telescope Casual is one of the brands we carry and they have a high level of quality for aluminum outdoor furniture. They are a brand we can definitely recommend. The warranty of their finish is 3 years, therefore it is normal for the powder coat to wear off after that time. The frame falls under the 15 year warranty and that is thanks to the weather resistant material and construction methods. You can rest assured it will serve you that long, if not more. We recommend using a cover to preserve the finish past the 3 year warranty. If you have stackable chairs we have a stackable chair cover that would work great. By keeping your chairs out of the rain and sun when not being used helps a lot to extend the lifetime of the finish. Nice furnitures. Thanks For Sharing.. Your expert question and answer service is great! Keep up the good work! We are looking for a outdoor patio dining room chair with a seat that is 24″H (shorter than the typical bar stool seat), with a matching outdoor DR table. We prefer the chairs that do not have cushions. We definitely recommend taking a look at our selection of dining sets and start to figure out what kind of style, material, and shape/configuration you are most interested in. With that information we can start making recommendations that suit your needs. Sling is also a great choice for chairs that don’t need cushions but are still comfortable. I’m looking for a fully upholstered outdoor set. Recommendations to brands? My hesitation with wicker is that it gets so hot and with two small children, I can’t take that chance. You should definitely take every precaution when it comes to the safety of your children. You might want to look into brands that like to use large over-sized cushions that are extra thick and plush. Brands such as Sunset West, Sunvilla, and Gensun Casual Living come to mind. We would also recommend using light fabric colors so they reflect more heat and don’t get as hot as darker colored fabrics. Another product you may want to consider is the Element Collection by Harmonia Living. It uses the same sling material you see on chairs but it is wrapped around the entire furniture instead of just the seat and back. This gives the furniture a fully upholstered indoor look for outdoors. The sling material is also better at staying cool under direct sunlight. Do you have an opinion on the plastic plank adironack style chairs? I’ve seen a pretty wide variation in sturdiness and material flex. The highest quality plastic plank adirondack style chairs are made by Polywood. They have made a name for themselves in the industry by offering high quality design, materials, and workmanship. All with a 20 year warranty that makes their furniture the most reliable and worry free. We have a variety of their chair models here on our showroom and I can tell you that they are very sturdy and flex very little. When you knock on them it sounds like real wood. Do you have an opinion on the Teak outdoor furniture sold by Restoration Hardware? We have never carried teak furniture by restoration hardware so we can’t make an opinion based on our own personal experience. However, I would encourage you to take a look at their Yelp page and see what their own customers have to say about their products and service. Customers have told us that they were not satisfied with the cushions for the teak outdoor furniture by Restoration Hardware. You write up is a wealth of knowledge, thank you! I was looking cast aluminum patio furnature from BEKA, can you tell me if this brand is low/ medium or high quality by the description on their web site? They offer a 10 year warranty on their frames, 3 year warranty on finishes, the products are made in China. Would it be a product you feel meets your standards and be carries in your store ( that tells me you would approve of the product:)). Hello, thank you very much for the compliment. Without seeing their furniture in person, we can’t make a first hand assessment as to the level of quality. We took a close look at their warranty, and a 10 Year Warranty for a cast aluminum frame is fairly standard. A frame of that kind should last at least that long. What a customer would want to consider when shopping for cast aluminum furniture is the warranty of the finish. After all, this is a more accurate measure of how long the furniture will actually be used. Once the finish starts chipping and falling off, nobody is going to want to put it on their patio. BEKA offers a 3 Year warranty, which is fairly standard. A warranty of 5 Years would tell us that the manufacturer has a lot of faith in the quality and durability of their finishes. And there are plenty of manufacturers that do offer that kind of warranty on the finish. There are manufacturers out there who are willing to put a 5 Year Finish Warranty behind their products and even cover blistering or peeling due to exposure. And they don’t require their customers to do anything other than enjoy their furniture. Another consideration is the warranty of cushion fabrics and sling. A one year warranty is very low. A 3-5 year warranty for fabrics and slings is much more standard. And again, the warranty states, “Warranty does not cover … fading or discoloration of fabric that is caused by exposure to the elements.” I wouldn’t even consider that a warranty. A warranty should re-assure you against these kinds of things, not the opposite, especially when it is patio furniture we’re talking about. What brand do you recommend for cast aluminum patio furniture? If the finish fades, or peels and the company does not cover it under warranty, can a home owner paint or refinish it themselves to maintain it instead of buying a new set? Are you able to list the top companies (size wise) for chaise lounge sales? I am interested in looking at this companies for this type of furniture. Can you comment on the ease of using Gloster extension tables. Do you ever recommend using a bench on one side instead of chairs? Also, you mention their use of high quality teak but what about their cushions? Thanks. We don’t have any first hand experience with Gloster extension tables so we can’t comment on their ease of use. We do admire the quality of Gloster products so we can only assume that their extending tables meet that level of quality. The benefits of using a bench instead of chairs is that you can squeeze more people when needed. A 3 seater bench can squeeze in 4 people but 3 chairs can only ever sit 3 people. So it’s great if you have kids or very casual dining with close friends and family. A bench is also multi-functional because you can use it for additional seating in any space. Just put it up against a wall and you now have comfortable outdoor seating for your guests. Another benefit of benches is that they can be hidden away completely underneath the table (being the right size & shape of course) so they don’t take up space when not being used. There is no right answer, more of what is right for you. There are benefits to using individual chairs to consider as well. Chairs help create a more formal setting and are much more comfortable for sitting in over long periods of time. So they are great if you’re the type of person to enjoy an outdoor meal with friends and want to enjoy each other’s company for a few hours. Chairs are much better for your posture as well. On Gloster’s website, they state that they use Sunbrella RAIN fabrics for their cushions. That’s a very high quality fabric for cushions. More so than the standard Sunbrella fabrics. RAIN fabrics are made using more material and a tighter weave to create a fabric that is extremely water resistant. Much thicker than the average Sunbrella fabric. Sunbrella is the gold standard when it comes to outdoor fabrics. Can you comment on the quality and warranty of Summer Classics aluminum patio furniture? I am looking at the Croquet set as there are many pieces in the series to fit what we want to on our patio which is under roof but open on 3 sides. There is some direct sunlight early am and late pm but not in full sun all day. We do have a saltwater pool a flight of stairs down. How do they compare to Woodard- similar or much farther down on the list in regards to quality and warranty? I like a Woodard set also but would need to mix pieces from different collections to fit our needs. Both are similar in price but I have been burned buying patio furniture where the finish oxidized and peeled off after one season and want to make sure I buy something that will last this time. Compared to Woodard, the warranty for Summer Classics is not very substantial. Woodard warranties their aluminum frames for 15 years and the finish for 7 years. Compare that to a 1 year “Limited” warranty by Summer Classics. One of the best indicators of quality is the amount of faith a manufacturer puts in their products. The warranty is a reflection of what the company really thinks of their products. I enjoy your blog and appreciate your advice. We have a 150+ year old house with a good-sized front porch. Can you suggest a high quality manufacturer of old fashioned-looking white wicker porch furniture? Everything I see looks too modern for our period home. Our eight year old white resin porch furniture (porch swing, sofa, chair, coffee and end tables, etc.) is falling apart. 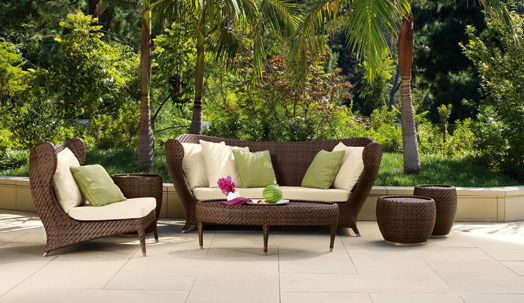 One of the collections that comes to mind is the Rockport Collection by Forever Patio. The collection comes in a vibrant white wicker and has that classic patio style that is still popular. Another option is the La Costa Collection by Sunset West. It is not a white wicker unfortunately but it does come in a very attractive French Grey finish. Great blog!!! Nice wooden furniture . Thanks for sharing . Wonderful blog about Patio furniture. Thanks for publishing awesome blog post. Unfortunately would have to disagree with your high rating of Woodard. Bought a full set of Landgrave outdoor furniture: sofa, 3 arm chairs, coffee table, 3 side tables, 2 lounge chairs, dinning table, 6 chairs and 2 swivel chairs. This furniture is expensive, but thought I was making an investment in durability given that I live in Florida. The did not hold up at all even though furniture was not heavily used. Lounge chairs warped, dinning table tiles bubbled and cracked, metal frame paint corroded and peeled especially on the base of the swivel chairs. However, worse of all Woodard did not stand by their warranty. Battled for a year to get service via the retailer Furnitureland South (they were great and persisted on my behalf) as instructed. Woodard had the audacity to state my furniture was not theirs even though I had every receipt and every tag from every item (yes, I keep everything) and pictures of their plaque on each chair as well as the full support of the retailer. Finally, Furnitureland South gave up on Woodard and sent someone to repair the furniture at their expense. Still furniture continues to deteriorate…..
Will never buy nor recommend Woodard to any one – ever! Unfortunately would have to disagree with your high rating of Woodard. Bought a full set of Landgrave outdoor furniture: sofa, 3 arm chairs, coffee table, 3 side tables, 2 lounge chairs, dinning table, 6 chairs and 2 swivel chairs. This furniture is expensive, but thought I was making an investment in durability given that I live in Florida. The furniture did not hold up at all even though it was not heavily used. Lounge chairs warped, dinning table tiles bubbled and cracked, metal frame paint corroded and peeled especially on the base of the swivel chairs. However, worse of all Woodard did not stand by their warranty. Battled for a year to get service via the retailer Furnitureland South (they were great and persisted on my behalf) as instructed. Woodard had the audacity to state my furniture was not theirs even though I had every receipt and every tag from every item (yes, I keep everything) and pictures of their plaque on each chair as well as the full support of the retailer. Finally, Furnitureland South gave up on Woodard and sent someone to repair the furniture at their expense. Still furniture continues to deteriorate…..
Hiee there!!! Thanks for this Pictures. All Furniture’s picture are great. I am looking for quality patio set (seating) I saw castelle “coco isle” can you pleas rate the quality and were I can get the best price. Thank you for your comment. We have never seen their products in person so we can’t give an informed opinion. However, we checked out their website and the manufacturer offers a strong warranty on their products. This a very good sign because outdoor furniture with strong warranties has to be well made and built to endure the elements. Good luck on your hunt for patio furniture! Curious about your thoughts on the brand Sunvilla? I couldn’t find any reviews on the brand itself, but since it is mainly sold through Costco, I am making a few assumptions about its quality. The particular set that we are interested in has powder coated aluminum frames with Sunbrella cushions. Sunvilla has a long history in the outdoor furniture industry and they have made a respectable name for themselves. We do carry their Portica branded products on our website as well as have them displayed in our showroom. So we can speak about these products from experience. As far as Portica is concerned, they are high quality products with strong warranties. 15 Year warranty for the frame and 5 year for the finish. That’s a very good warranty and speaks to the level of quality and confidence placed in the product. From what I have heard, the Sunvilla brand of products is slightly more affordable than Portica but still offers a comparable level of quality. There are many things a manufacturer can do to bring down price without sacrificing quality and that’s what Sunvilla seems to be doing. So if you’re looking for something that is of high quality but a little more on the affordable end of the scale, then Sunvilla might be worth taking a look at. Thank you – I appreciate the insight and quick reply! I love the comprehensive guide, but the post could be more helpful if you listed the chairs prices. Now I have to go to Amazon.com to get the prices for each chair. Do you have any information regarding the LARGEST or Key Players in the outdoor furniture industry? Essentially, who is really controlling the market right now? Largest brands. Thank you for your comment. That is a very good question. First of all, it’s important to understand that there are different markets within the outdoor furniture industry that cater to different clients based on their needs and spending level. For example, the commercial market caters to hotels, restaurants, and other types of businesses. The pricing for these products is generally out of range for the average consumer. For residential clients, the industry caters to 3 different markets. There’s the low-end, the middle to high-end, and the luxury/designer-end of the outdoor furniture market. Each one of these markets has its own Key Players. We deal mostly in the middle to high-end, and a little bit in the luxury/designer-end. For middle to high-end furniture market, some of the largest brands include Sunset West, NorthCape International/Forever Patio, Sunvilla/Portica, Harmonia Living, & Mallin Casual Furniture. On the luxury/designer end, some of the largest brands include Brown Jordan, Gloster Outdoor Furniture, Jardin, Seasonal Living, and Tuuci. How did we decide these are key players? We decided on these brands based on our own experience of which ones sell the most year after year, as well as who are the trendsetters. The designs that these companies come out with year after year generally set the bar that other companies strive for. Why isnt JANUS eat Cie on your list? This list was created based on our own direct experience with these brands (seeing their products in person, customer reactions, and ability to fulfill orders and follow up on claims issues (customer service). Unfortunately, we have never had a relationship with JANUS et Cie, therefore we can’t make an informed opinion about them. We did browse their website and can say they have some beautiful pieces that are very distinct and stylish. Seems like a high quality brand. Very good information. I have a questions about patio furniture that I might purchase from Macy’s. Some of the manufacturers are: Genevieve, Harlough II and Highland. I also intend to peruse “Chair King”, to see what they have to offer. Do you have any information on the Macy’s line of patio furniture or for that matter, Chair King? Unfortunately, we have never seen any of those brands in person so we can’t offer any information based on personal experience. That being said, there is still a lot you can tell about a brand just by looking at their warranties and the information they provide about materials and manufacturing process. In general, outdoor furniture falls into either low, medium, or high end. Low end furniture tends to provide warranties that only last a year or two. Medium end brands tend to offer warranties that last 3-5 years. High end brands offer warranties that last 10+ years. It all depends on the materials used but that is a good rule of thumb. The mention of materials and manufacturing processes is important too because brands that use high quality materials and manufacturing make sure the customer knows about it and won’t make that information hard to obtain. I happened upon your site while looking for additional information on several pieces of outdoor dining furniture we’re interested in. Do you happen to have any opinion on Gensun as a brand? I didn’t see any mention of it yet, but wanted your take on its quality or reputation in the market. We used to carry Gensun products on our website and we still have a few of their products for sale in our showroom. Unfortunately we no longer have a relationship with them as a retailer. Gensun is a high quality brand. They have very strong warranties and their products are made using high quality manufacturing. The only criticism I have about Gensun is that their collections tend to lean towards the traditional end of the spectrum. They have a few modern collections that are actually very nice and they also offer a high level of customization when it comes to finishes and wicker colors. Gensun has been around a long time and is respected in the industry. They have won several awards for their manufacturing quality. There really are some gorgeous patio furniture collections out there. It’s a trend in interior design – unnoticeable transitions from indoor to outdoor living. Elegant furniture inside and out. Excellent article, thanks for the information about warranties. We decided on Westminster Teak based on their warranty and money back guarantee and so far we couldn’t be happier. We paid more for it but we live in Florida and needed something that would last. Couldn’t agree more about Sunbrella also, it really does make a difference. Hi do you have any experience/comment with klaussner outdoor furniture? I purchased a large set of 10 year old Lloyd Flanders wicker furniture at my neighbor’s yard sale. It needs some TLC and I’m prepared to make the necessary repairs. I’m wondering if you think this brand of wicker furniture is worth the effort and cost to repair, or am I better off purchasing new furniture? I spent only $100.00 dollars for multiple pieces and new cushions. I gave several pieces to friends and family. I’ve kept 6 lounge chairs and end tables for myself. All pieces need repairs and repainting. Fortunately I’m handy with this type of work. I’ll follow DIY instructions for reweaving wicker caning and spray paint all pieces with oil base paint. My husband thinks this set is not worth the effort. Although I understood Lloyd Flanders (LF) to be a high end quality manufacturer whose been making wicker furniture since the early 1900’s for large hotels across the country. I didn’t see LF mentioned in your article so now I’m questioning my decision to keep and repair these chairs. Do you think they’re worth the effort? Thank you for your input. Your furniture products are awesome. A good collection of furnitures. amazing post and beautiful photos thank you. Any feedback on the brand BeachCraft brand of outdoor furniture. Hello Ada, thank you for your comment. Unfortunately, we have never seen BeachCraft products in person so we can’t make an informed opinion about their products. We always remind customers that you can tell a lot about the quality of an outdoor product by the strength of the warranty a manufacturer is willing to put behind their product. 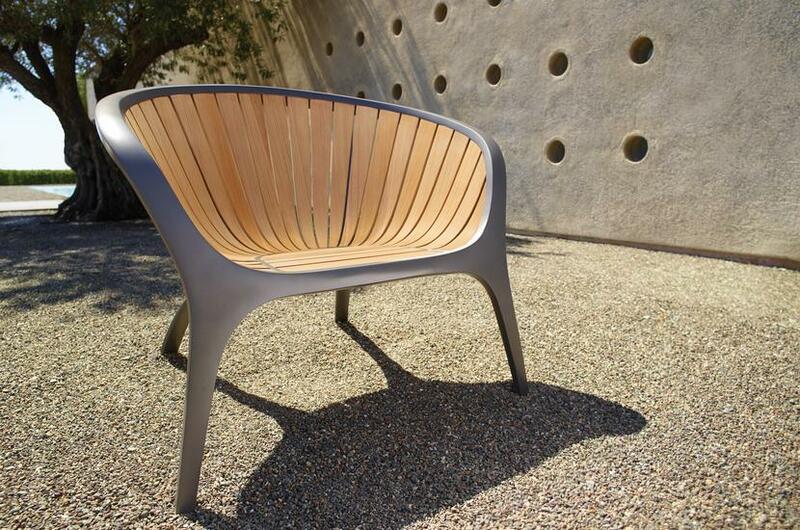 More than any other type of furniture, outdoor pieces are subject to harsh conditions. The stronger the warranty, the more faith the manufacturer has in their product.